I remember it like it was yesterday. Along with my brothers I went to the cinema on the opening day of The Lord of the Rings: The Fellowship of the Ring, on the cold evening of December 19th 2001 in Dublin. I never read the books before seeing the film, but during the opening scenes I fell in love with the world of Middle-Earth. From the depiction of the War of the Last Alliance, the sight of Sauron towering over every other person on screen, the journey of the ring into Bilbo Baggins' hands and the start of Frodo's journey in Hobbiton, it was unforgettable and ultimately made a long lasting impression on me. Really, I can't stress that enough! However, while most videogame tie-ins with films are horrible, the official The Lord of the Rings games were different. 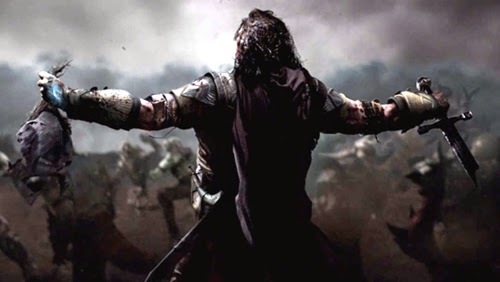 EA covered all videogame adaptations of The Lord of the Rings for 7 years, and despite some titles being terrible, most of them were great, especially The Third Age, The Battle for Middle-Earth and The Return of the King. After EA's 2009 lacklustre The Lord of the Rings: Conquest, Warner Bros' have taken over the rights. They haven't been milking the franchise like EA did, but for the past few years I've been left wanting more. Now the day has come where Warner Bros. have finally delivered. But is it worth the wait? Developed by Monolith Productions and out now on Xbox One, Xbox 360, Playstation 4, Playstation 3 and PC comes Middle-Earth: Shadow of Mordor, one of the best Middle-Earth games ever made. The story of Shadow of Mordor distances itself from both the movie versions of The Lord of the Rings and The Hobbit. Instead, this tale takes place between the those film trilogies, and puts you in the role of Talion, a ranger of Gondor. Talion was in charge of guarding the Black Gate of Mordor, but after a viscous attack by Sauron's armies, he is brutally murdered alongside his family. Talion is revived by the wraith spirit of Celebrimbor, the Elven prince who forged The Rings of Power. Now, with the help of Celebrimbor and his wraith abilities, Talion goes beyond The Black Gate of Mordor to seek revenge. Shadow of Mordor is a third-person open-world game entirely set within Mordor. However, this is long before the region was poisoned by Sauron's presence and influence, as in this game it has some colour and life to it. Getting around the world is quite a lot like in Assassin's Creed. From walking, sprinting and climbing up buildings, cliffs and other tricky terrain, controlling Talion is quick, easy and huge fun. Though the game world may not appear gigantic at first, Monolith Productions have done a great job at squeezing a lot of content into it. Though there are areas of pure open exploration, you never really have to go too far to find a stronghold, town or building of importance. This, alongside the absolutely insanely stunning visuals, makes for one of the best, most reactive and breathtaking open-worlds I have ever enjoyed. Hey, I know it's the hive of scum and villainy of Middle-Earth, but it's gorgeous! Shadow of Mordor offers the player both a stealthy and direct approach to gameplay. Stealth is fantastic, as even if you plan of diving into battle head-on later, taking out of few Uruks at first will go a long way towards victory. While controlling Talion is somewhat similar to Assassin's Creed, combat takes a page out of Batman: Arkham Asylum's book. Primarily relying on simple attacks and well timed counter-attacks, there's also a whole host of weapons and powers to unlock, with finishing moves being deliciously brutal and violent. However, anyone assuming it's identical to Arkham Asylum will face immediate death, as running headlong into groups of Uruk's in Shadow of Mordor is far trickier than you might assume. They're fierce, unrelenting and until you level up Talion after a few hours into the game, they'll kill you more times than you might want to admit. That said, sticking with it is worthwhile, as once you've unlocked some of the stronger and stranger attacks, Shadow of Mordor's combat is a thing of beauty. The most interesting element of the game comes in the form on the “Nemesis System”, which is essentially an ever changing hierarchy of Uruk leadership. For instance, after going head-to-head with an Uruk captain and killing him, a different Uruk will take his place, thereby altering the ranks of their armies. However, if an Uruk captain kills you, he'll not only level up and receive additional armour, but he'll also remember you during your next encounter with him. In fact, if you so choose much of your time playing Shadow of Mordor will be spent tracking down Uruk's who have previously killed you, simply in order to exact revenge. Interacting and altering this hierarchy system gets more interesting when you unlock the wraith power which puts enemies under your control, which means you can literally place your own Uruks into positions of power. Needless to say, the Nemesis System is truly brilliant, and something I can imagine will be copied in various games from here on out. Overall Middle-Earth: Shadow of Mordor is incredible. Gone are the days in which I thought Warner Bros. were wasting the opportunity of having the Middle-Earth licence. Though it does step on too many toes when it comes to the lore J.R.R Tolkien put in place with his books, it's a gaming experience that must be played, both by fans and non-fans of the source material alike. Blending impeccable visuals together with smooth intuitive gameplay, and a complete game changer in terms of the Nemesis System, this game is not to be missed. Middle-Earth: Shadow of Mordor is one game to rule them all and gets a 5/5.